Google Apps for Work continues to forge ahead, with the company revealing Tuesday today that 2 million businesses are now paying to use some part of its online productivity suite. The service, which includes a business-specific version of Gmail and a version of Google Drive that lets employees work together, competes against established players like Microsoft as well as newcomers like Dropbox and Quip. As part of its push to expand the reach of the product, Google announced eight "recommended partners" that offer add-on products to help companies with needs that Google doesn't necessarily tackle itself. "These third party solutions have been reviewed by Google for the quality of integration; we have done a pretty robust assessment of their security policies, including penetration testing; and we've picked solutions in categories that we thought were the most critical business needs of our customers in extending Google Apps," said Apps for Work Managing Director Rahul Sood. The chosen partners include CRM provider ProsperWorks, cloud telephony providers RingCentral and Switch and project management/spreadsheet software firm Smartsheet. 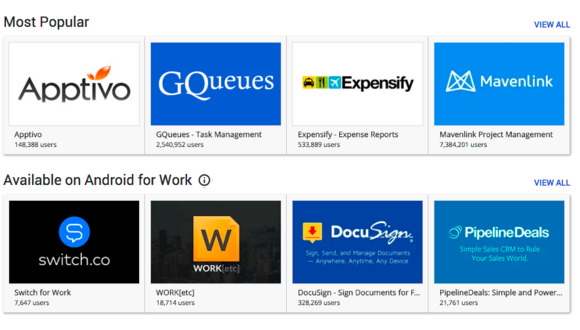 Companies that become recommended partners will get promoted through the Apps for Work administration console and the Google Apps Marketplace (a repository for services that connect with Google's productivity tools). Google is starting with a fairly small group of companies but plans to expand its recommendations in the future. The announcement points to the different markets Google is trying to attract with Apps for Work. Sood referred to ProsperWorks as CRM software for small businesses, but also said that the integrations with identity providers like Okta and document management services like Powertools are aimed at larger enterprises that need that level of management capability. Google also announced that it's connecting web apps that integrate with its productivity suite to their Android app counterparts in the Google Play Store. Now, people who go to the Google Apps Marketplace to find a web app will be able to also find a matching Android app, where it's available. Google will also notify customers using a web app through the Google Apps Marketplace if that app becomes available for Android. It's a way for Google to both drive adoption of its mobile platform by people who are already using its collaboration tools, and to boost the profile of developers building applications for both of its platforms. The news comes roughly two weeks after Google announced it's trying to poach companies from Microsoft Office by offering them free access to Apps for Work for the length of their existing enterprise agreement contract, so long as they agree to pay for a year of Google's services after the free period runs out.